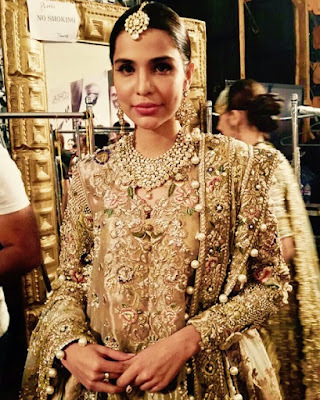 Pakistan L'Oreal Paris Bridal Week (PLBW 2015) has been the predominant fashion event making headlines this month. 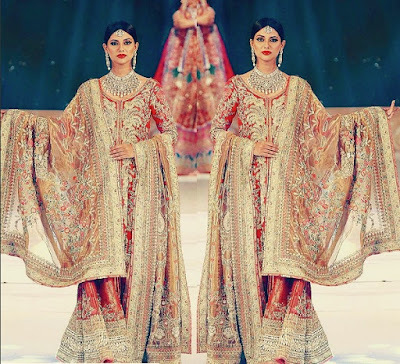 Designers catering to the high demand for exquisite bridal outfits and wedding trousseau by the insatiable fashionistas of Pakistan have not failed to deliver. Fashion enthusiasts were dazzled with a wide array of silhouettes, exquisite varieties of handiwork and embroidery, luxurious cloth materials and copious attention to detail. 22 brands showcased their collections this week, ranging from fashion heavyweights to newcomers launching their first bridal collections. I decided to make a list of few of my favorite pieces from the PLBW that took place in Lahore, Pakistan during the three day period of 16-18 September 2015. I will start with the collection which I think was one of the best of the week. That honor was bagged by Elan which showcased its collection titled 'The Jasmine Court'. 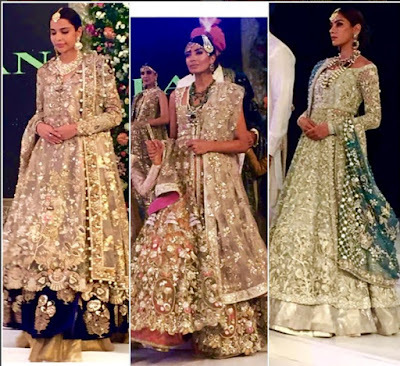 When it comes to wedding wear, I personally prefer bright colors but Elan is such a master when it comes to intricate details and ethereal craftmanship, it is as if everything it touches turns to gold and that is quite the complement. 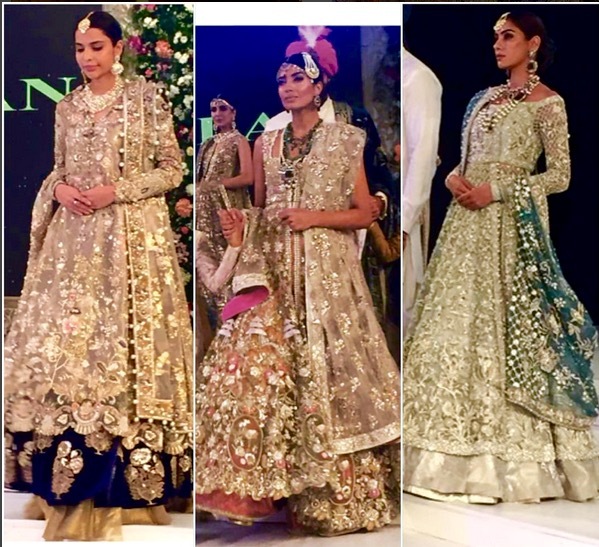 Elan wanted to create a collection that would be a heirloom since a bridal outfit should be beautiful and timeless enough to pass on to the next generation. I believe it has managed to achieve that goal. 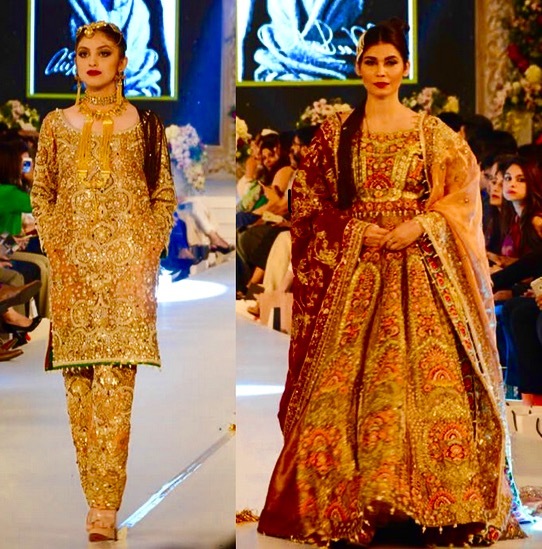 Ali Xeeshan also showcased his collection on Day 1 and titled it 'Tufaan'. There were some misses but some gorgeous pieces as well, which scream royalty and opulence. Ali Xeeshan is known for drama and adding an element of theater in his shows, and he added it again to this one. The audience was in for a surprise when Mickey and Minnie showed up in traditional outfits during the fashion show. 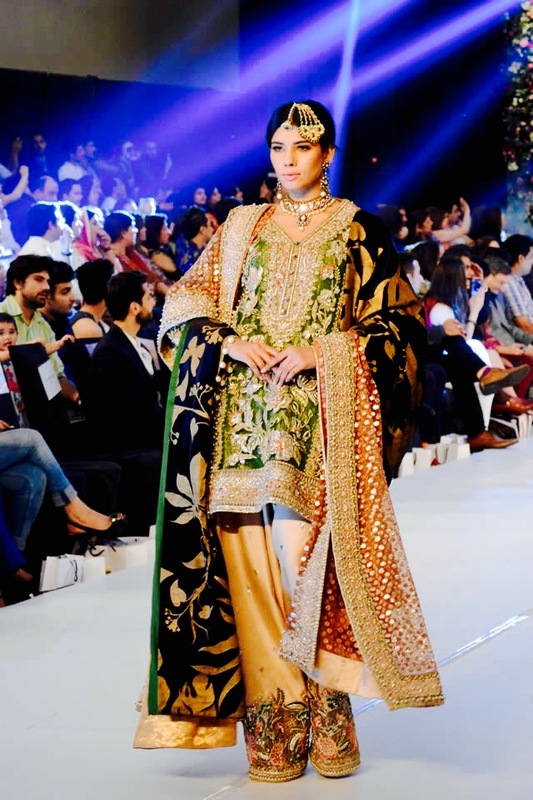 Below is another gorgeous piece by Ali Xeeshan, fit for a princess. Fahad Hussayn named his collection 'Matam' which I was surprised to hear, since Matam in the Urdu language means mourning. 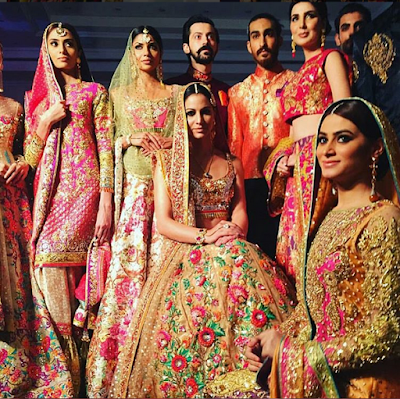 I mused about why a fashion designer would name their bridal collection 'Matam'. It turns out that he was inspired by how intense the act of matam is and so that intensity along with Chinioti craftmenship was the inspiration behind his collection. Two of my favorite looks from Fahad Hussayn's collection are shown below. Kamiar Rokni is one of my personal favorites and was the best on day 2. 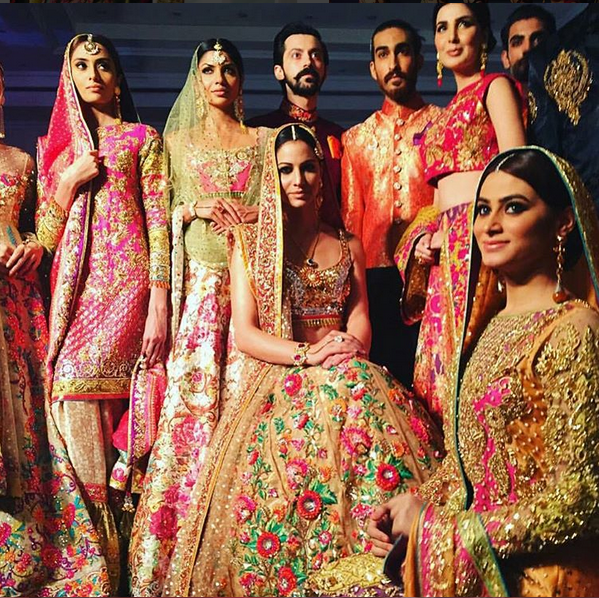 I love how the outfits of the House of Kamiar Rokni are so vibrant and colorful and at the same time have such beautiful intricate details. The designs are a beautiful marriage of traditional and modern with unique color combinations and artistic silhouettes. My favorite piece from the collection titled 'Alchemy' is shown below. 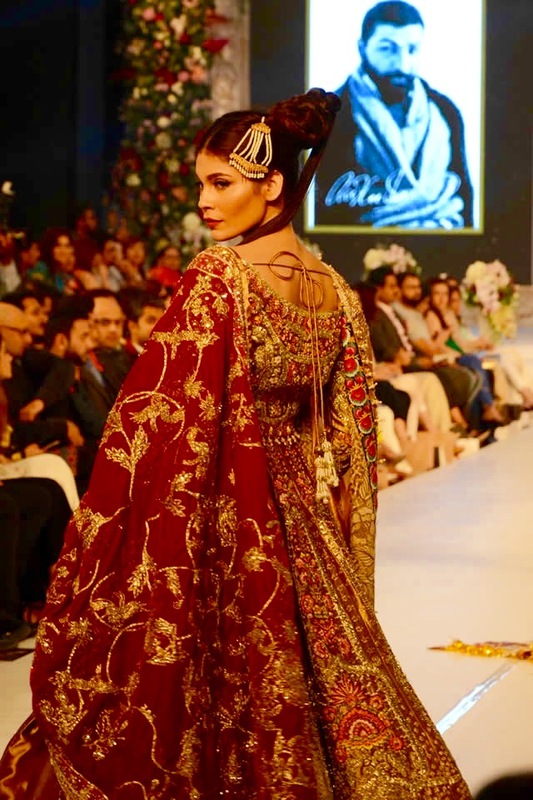 Nomi Ansari held to his trademark style of vibrant colors in the clothes he designed for the PLBW collection titled 'Oudh' and was inspired by the boldness of the fragrance itself. 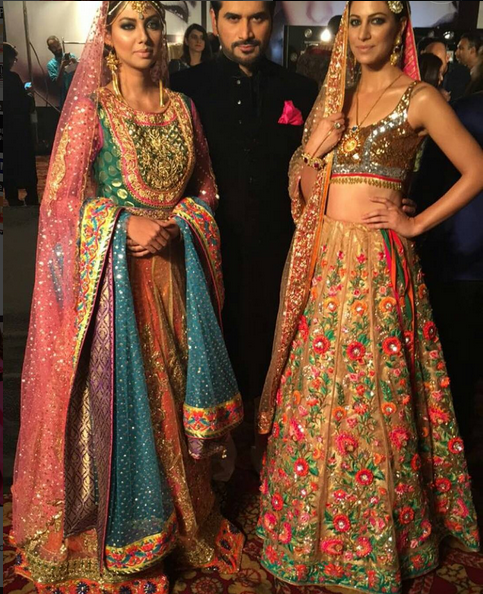 It was a stunning collection, colorful like an artists palette and at the same time embellished with intricate detailed embroidery to make heads turn. 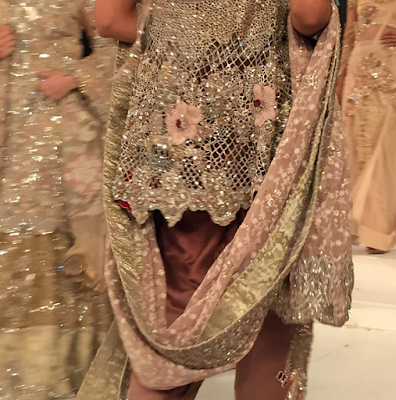 Another picture showing more clothes adorned by the models of the Nomi Ansari fashion show is given below. 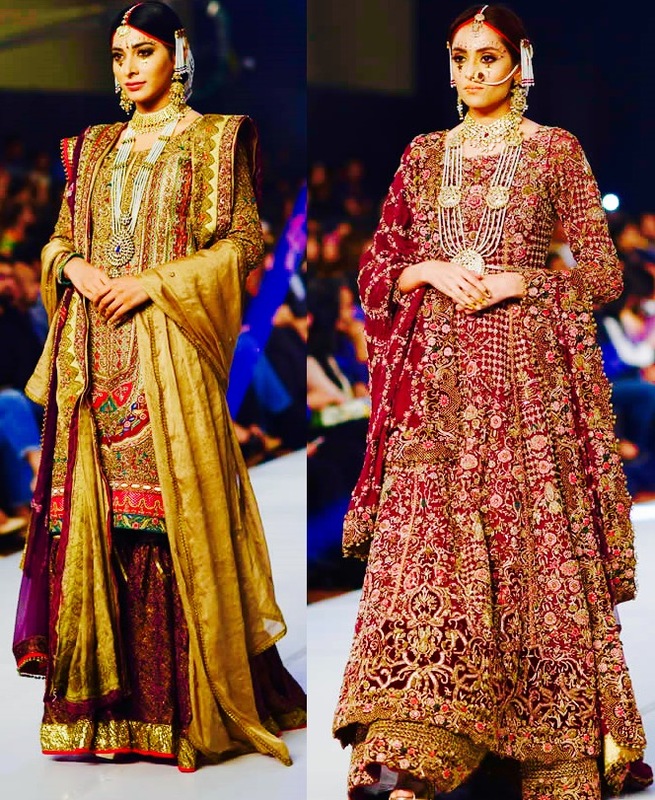 A noteworthy mention would be fashion designer Ammara Khan whose collection titled 'Memoirs from a Moonlit Garden' had stunning details and cut-work on it. The colors were a bit dull but the handiwork and craftsmanship was brilliant as can be seen from a close up picture given below. Overall I would say that PLBW 2015 was indeed a success. In fact it would not be an exaggeration to say that PLBW 2015 has shown that when it comes to fashion and luxury, the Pakistani Bridal fashion market can indeed be amongst the leaders of the world. Wow its outstanding work and brings you in dreams and in imagination, outstanding work you have shared thanks for it.